Mango Lassi is a traditional South Asian beverage. In fact it is one of the most popular beverages in Northern India. 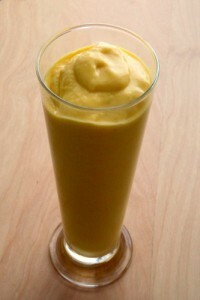 The mango lassi drink is a cross between a smoothie and a milk shake and is smooth, creamy. The mango is native to South Asia, from where it has been distributed worldwide to become one of the most cultivated fruits in the tropics, however, they are used in many ways across cultures. For example, in tropical countries, sour, unripe mangoes are used in sauces, or may be eaten raw with salt, chili or pumpkin seeds. In India, ripe mangoes are also used to make curries or lentil dishes. The pulp from ripe mangoes is also used to make jam, juices or ice cream. Mangoes can be dried or cooked with rice for an Asian-style desert. Mangoes are often prepared charred in the American state of Hawaii. Honey doesn’t have the same effect on blood sugar as sugar. It keeps your blood sugar stable and is a good source of natural energy. Honey can also be good for coughs, sore throats and you can apply it to heal cuts and burns. A dash of ground cardamom (optional). Put mango, yogurt, water, honey and cardamom into a blender and blend for 2 minutes, then pour into individual glasses, and serve. Sprinkle with a little cardamom, if desired. The lassi can be kept refrigerated for up to 24 hours. Cardamom is grown in the tropics on bushes that produce little pods. This spice has lots of health benefits. It can provide energy and help you digest your food too. Mango has vitamin A which means it’s good for your eyes! Mango is the national fruit of both India and the Philippines.